Anti-Israel activists rightly see American evangelicals as key to U.S. support for Israel. That is why they are targeting evangelicals with messages of pro-Palestinian solidarity as supposedly central to Christian compassion. 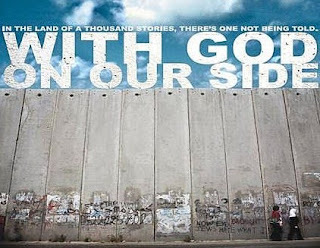 A new evangelical film, “With God on Our Side,” is coming out this month to rebut pro-Israel Christians and persuade them to champion the Palestinian cause. The film’s purpose, as its producer explains, is to take American Christians off the metaphorical tourist trail of their narrow pro-Israel stance and instead wade them into embittered Palestinian communities where supposedly they will learn the truth about who is really to blame. Here, of course, is the simplistic stereotype about pro-Israel evangelicals the film hopes to perpetuate. American evangelicals self-servingly only support Israel because a Jewish presence there is central to their blood thirsty, apocalyptic dreams about the Second Coming. The film soothingly implores evangelicals to consider a nicer path. “There is the path of deep compassion and mercy and justice and peace,” offers one voice in the film trailer. “Or there is the tradition of Berlin Walls being built and excluding people who are not of us.” So it’s really very simple. Support the apartheid-like, Jewish wall-builders, or stand with the persecuted Palestinians. Of course, their persecution is faulted not just on Israel, but also the United States, especially its evangelicals. Here is the film’s main message to evangelicals, especially to young people. The Old Religious Right crassly imposed a pro-Israel U.S. foreign policy based on its end-times theology, creating untold suffering among largely innocent Palestinians. More thoughtful, more compassionate evangelicals will reject that heritage and instead stand with the Palestinians as the victim group most needing Christian compassion. The film interviews Ben White, an anti-Israel British journalist, Stephen Sizer, a Church of England priest and anti-Israel author who infamously has taken his message to Iran, Gary Burge, a professor at evangelical Wheaton College outside Chicago who is a critic of pro-Israel evangelicals, and Salim Munayer, a professor at Bethlehem Bible College, which markets Palestinian Liberation Theology. Munayer pleads for more American evangelical concerns about self-image. “You need to understand how American Christians have been perceived by Middle Easterners,” he warns. “We stand for wars, we want to be richer, we don’t care for the poor, we want only our interests, we stand for moral values that stand for our desires. We stand for power and not stand for peace.” Munayer reports that Muslims often ask him why American Christians “hate” Muslims. “Why do Christians want us to move out of our home and not stand for what is right and just,” they purportedly ask him. Does Munayer ever ask his Muslim interlocutors what compromises of self-interest they are willing to make for peace? “With God on Our Side” wants increased U.S. pressure on Israel to accommodate Palestinian demands, facilitated by reduced U.S. evangelical support for Israel. And the ultimate goal is what? A Palestinian state based on the unstable 1967 borders and ruled by Islamists like Hamas or kleptocratic secularists like Fatah? Or is it to dismantle Israel altogether in favor of a single nation, where an unrestricted “right of return” for Palestinians leads to a collapse of Jewish democracy? How are the dwindling numbers of Palestinian Christians faring under Palestinian rule now, and how would they fare under a victorious new, Islamic-dominated Palestinian state?